Range included Hokkaido and Sakhalin islands, the Kamchatka peninsula, and Iturup and Kunashir islands just to the east of Hokkaido in the Kuril archipelago. The Hokkaido wolf (Canis lupus hattai) is a subspecies of Gray Wolf. Scientists believe it became extinct in 1889. 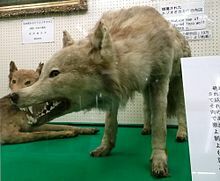 There are people who said to have seen some Hokkaido wolves after that year, but there is no proof that they actually did. In the Meiji Restoration in Japan, Japanese farmers wanted to have American-style ranches for raising livestock. A US farmer named Edwin Dun started to import livestock to Japan. When the wolves began attacking the livestock, farmers started to kill them, using poison.